The free College Loan Calculator has everything you need to plan for your life after college. Too many students are struggling to repay their loans after they graduate because they don’t have a solid financial plan. Even worse, students are now struggling to find work at decent wages, even though they have this tremendous new debt. The free College Loan Calculator is here to help students gain the foothold they need to get started on repaying debt. The template creates a space where students can assess their debt and figure out how much they need to repay on a monthly basis. To learn more and download the free template today, just follow the link below. To download your new College Loan Calculator, click the link at the bottom of this page. Start by entering the amount you expect to make after graduation. In the next space to the right, enter the date you’ll begin repaying your student loans. The table below will let you enter as many different lenders as you’ve acquired since you first started school. Once you’ve entered the loan amount and date above, you can start breaking down your lenders in the table below. Start by entering your loan number, the name of the lender/lending company, the loan amount, annual interest rate, and the start date/ the duration in years. The template will then give you the end date and the payments you’ll be making, as well as the total interest you’ll need to pay over time for each. 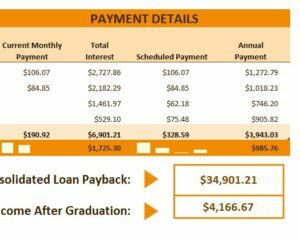 You can also see a calculated “consolidated total” at the very bottom of the template to show what you’ll make monthly, which will determine what you can afford for your repayment plan. If you scroll back to the top of the page, you can find the combined monthly payments and the estimated percentage of your income that your payments will take up.